​We are followers of Jesus Christ, our Lord, and we believe in the Father, Son, and Holy Spirit. 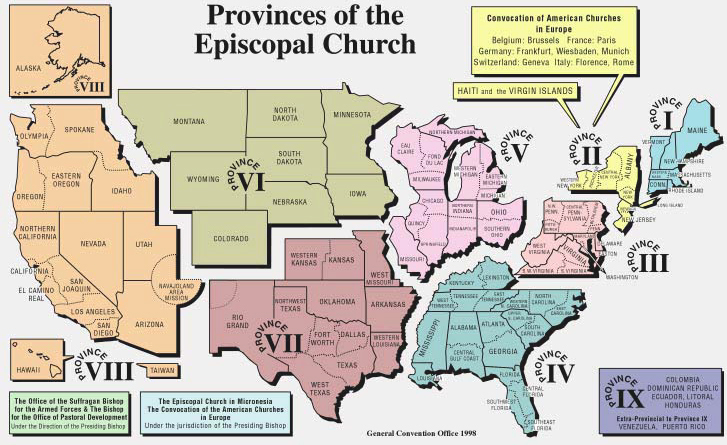 The Church has members in the United States, as well as in Colombia, the Dominican Republic, Ecuador, Austria, Belgium, France, Germany, Italy, Switzerland, Haiti, Honduras, Micronesia, Puerto Rico, Taiwan, Venezuela, and the Virgin Islands. 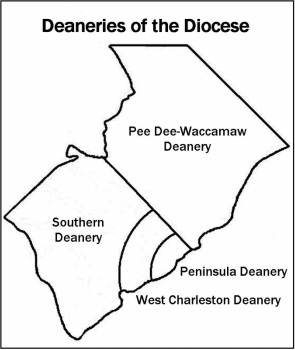 is in Province IV of The Episcopal Church, shown below. Our actions and beliefs are guided by Scripture, Tradition, and Reason. Through prayer we seek guidance and clarity from God for the ordering of our common life together. Unified by the Lord and the Anglican tradition of The Episcopal Church, we support our member parishes and communities of faith. Through pastoral ministries, we bear with each other our burdens, celebrate God's work in the Diocese, forgiving as we have been forgiven, and loving as Christ loves us. We are genuine, loving, caring and compassionate to others. Together, in Christ’s name, we reach out to the victims of hunger, fear, injustice, and oppression, the sick, the friendless, and the destitute, and those who suﬀer in body, mind, or spirit. We support each other, lay and ordained, with faithfulness in both word and deed. 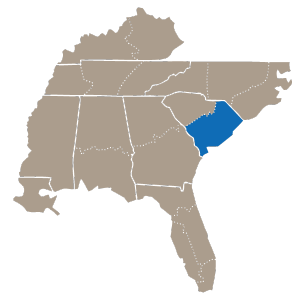 Grounded in prayer, we are present to one another, reaching out with authentic love and concern, and giving our gifts, talents and resources for the advancement of God's kingdom in our region of South Carolina.